Maintaining an active lifestyle in this day and age can be quite difficult. Kids today usually prefer to be sitting on the couch and twiddling on those gadgets than to be outside and enjoying various physical activities. This kind of sedentary lifestyle has a significant detrimental effect on your kids’ health. Studies have shown that this way of life is strongly associated to serious health concerns like obesity, diabetes, and heart problems. As such, to encourage their kids to go outside and play, parents usually get them different kinds of outdoor recreational gear such as trampolines, rollerblades, skateboards, bicycles, and scooters. 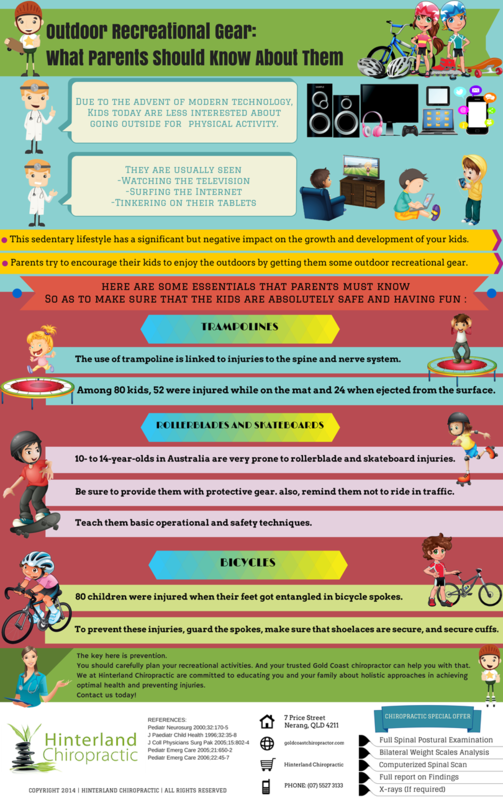 All of these will surely make your kids more appreciative of going outside and be more active. Then again, there are a number of things that parents should consider about these recreational gear. Your reliable Gold Coast chiropractor aims to prevent injuries and accidents from happening while your kids enjoy the outdoors. For more tips on helping your entire family achieve optimal overall wellness, consult your trusted chiropractor in Gold Coast here at Hinterland Chiropractic. We provide families on the Gold Coast with the very best lifetime health care. Using all-natural means and holistic approaches, we help you in achieving optimal overall health and wellness. Call us today on (07) 5527 3133 or book your appointment online.